Srinagar, February 08 (Scoop News)-We welcome the decision to create separate Ladakh Division but keeping the headquarter of Ladakh division permanently at Leh is discriminatory to the people of district Kargil. 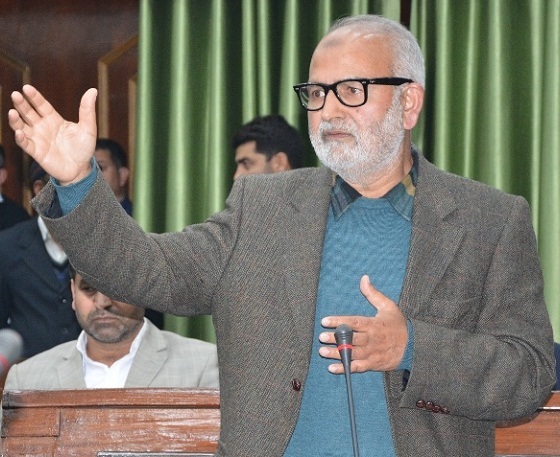 “We have received many suggestions and calls from Kargil today expressing their disappointment with the unilateral decision taken by the governor administration in their attempt to please the BJP which was recently routed in local bodies elections there and also is facing a crises after the resignation of their MP,” Party Senior Leader, Naeem Akhtar said. He added that the best resolution to this is to keep the headquarter both at Leh and Kargil at rotational basis. “It should ideally be in winters at Leh because of air connectivity and in summers it should be in Kargil. Unless that is done, this would create more problems in the sensitive region than it would solve,” Mr Akhtar said. The PDP leader added the decision to keep the headquarter of the new Division permanently at Leh is unacceptable to the people of Kargil and that if our party comes to power, it will keep the headquarters on rotational mode to ensure no discrimination is melted out to any of the district. He said that the people of Zanskar, Drass and Kumri find Srinagar more accessible than Leh and the administration must keep the needs of the people of Kargil and adjoining areas in mind while taking the decision vis-a-vis setting up of the headquarters of the new Division.